We do production of a lunchbox for general corporate , frozen cooked food production and nationwide sales, school meals contract business, the manufacture of a lunchbox for the trip or the event, and consignment business of Day service or hospital food. We set a “handmade” Since its inception as a corporate philosophy, we try the extensive menu and a variation can be glad for everyone to the elderly from children. 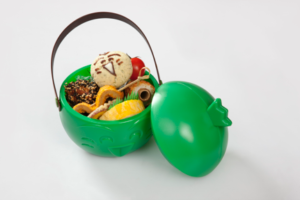 We introduce our products such as lunchbox and processes food made with Tokushima specialty ingredients. 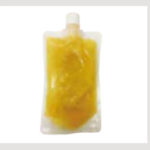 We are also looking for business partners who are interested in PB of processed food products. Feature: We fill this Sudachi kun OMOTENASHI lunchbox fulled with variety of delicious dishes using various kinds of Tokushima’s specialty ingredients with the box designed with Tokushima’s mascot character “Sudachikun.”. 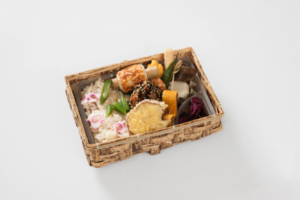 When you open the box, you will find pretty and unique lunch coupled with Sudachi (Japanese citrus)-taste “Mini Sudachi kun”. Feature: This is Tokushima’s specialty “Tai Meshi Bento”, in which we use natural sea breams from Naruto. Our natural sea bream is so delicious as it grows in the Naruto Whirlpools, which is called one of the three greatest whirlpools in the world. 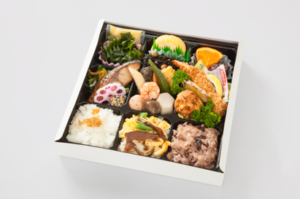 Feature: This is beautiful, colorful lunchbox including variety of Tokushima’s specialty food. You can enjoy this lunchbox for lunch during your trip. 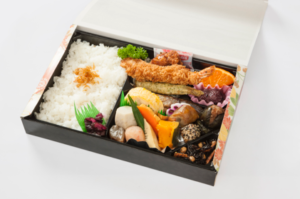 Feature: This is the most typical and popular Makunouchi Lunchbox among all generations. Please enjoy our handmade tasty dishes. Feature: We use steam cooking machines for high-pressured treatment to process the skin of Yuzu (Japanese citrus) from Tokushima, and then make paste from it using blender machines. By doing this, we can make the Yuzu paste which is much more creamy and aromatic than normal paste which is processed just by chopping up. It can be use as a source or seasoning for sweets.